After a winter with brutal weather that felt exceptionally long, just about everyone had been looking forward to spring this year! 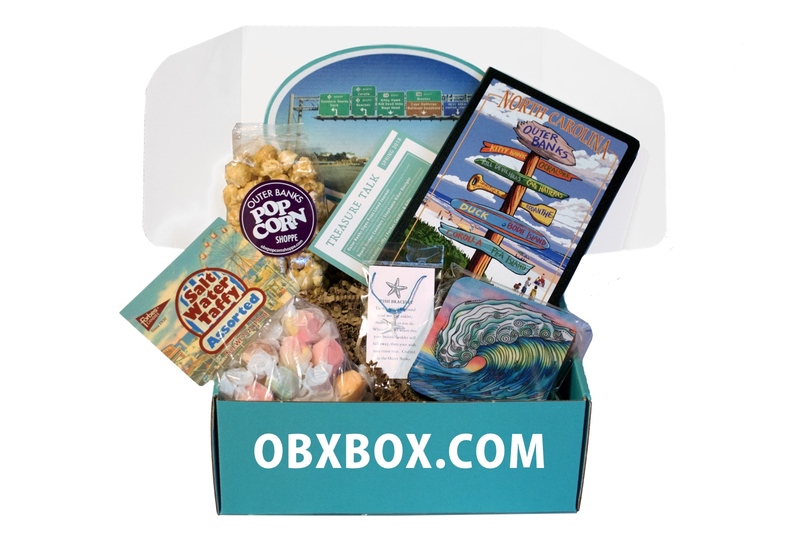 We took extra steps to ensure this box was bursting with color and plenty of goodies to get our subscribers a taste of the Outer Banks and primed for warmer sunny days to come! A classic! 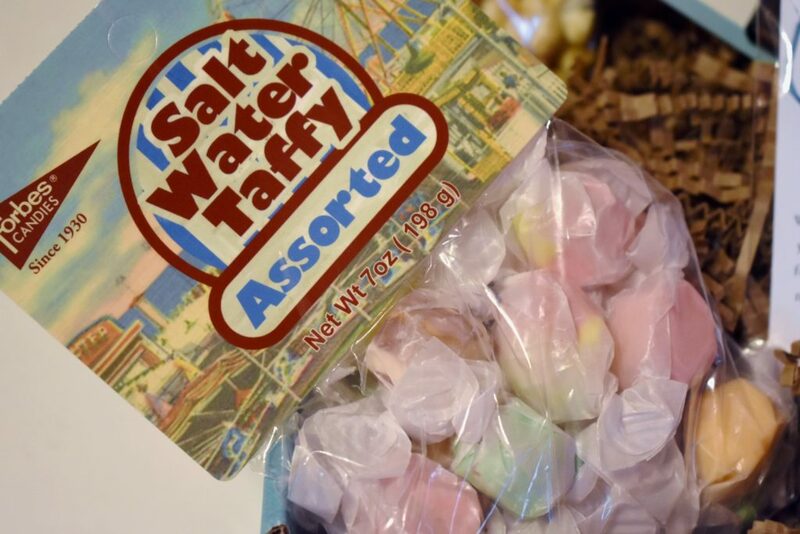 We chose a large bag of fresh saltwater taffy from Forbes Candies & Gifts for our spring box as it’s the tastiest around and a true crowdpleaser! Digging into the soft and sweet morsels, you’ll instantly be transformed into a state of daydreaming about days on the sunny seashore! 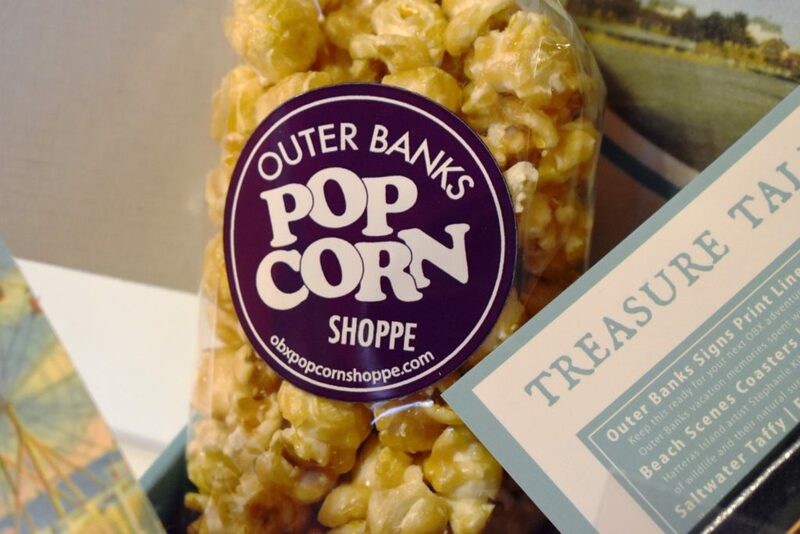 When it comes to popcorn, there’s none finer than the creations from the Outer Banks Popcorn Shoppe! They’ve got their corn down to a science, choosing only a certain variety known for it’s desirable surface area with more room to pour their tasty toppings on. Subscribers received a bag of gourmet caramel corn and we’re positive it didn’t last long! To order more popcorn in additional flavors or collectible tins, visit https://gourmetpopcornandgifts.com. Use coupon code “OBXBOX” FOR 20% OFF online orders! Expires 9/1/18. Make a wish! 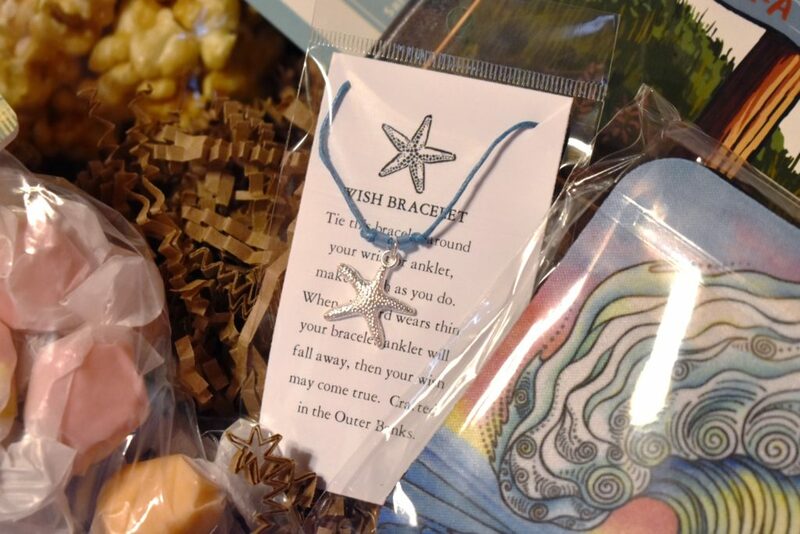 Available in a variety of nautical charms like starfish, mermaids, seahorses, sandals, and more, subscribers received a handmade wish bracelet created by local artist Chris Wolff. Wear this adorable charm around your wrist or ankle, and when it falls off, your wish may come true! You may have seen Wolff’s creations in the Lone Wolf Trading Company that was located in the Surfside Plaza in Nags Head. Chris now sells her jewelry throughout many local businesses on the Outer Banks including Gulf Stream Gifts on the beach road in Kill Devil Hills. As you walk through gift shops, cafes, and art galleries on the Outer Banks, it’s hard not to take in all the beautiful crafts and works of art and start developing a sense for “who’s who” and signature styles of individual artists. One artist with an incredibly alluring and memorable style for their depictions of nature and bold colors is Stephanie Kiker. 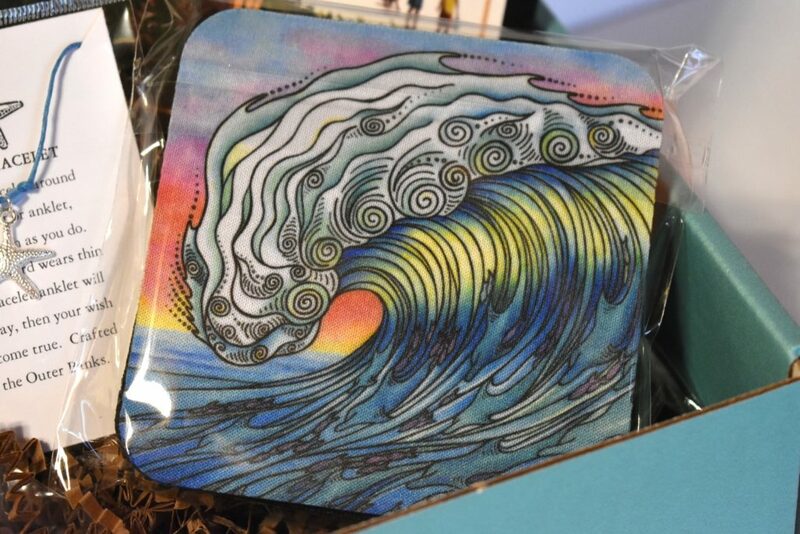 One of the most popular items from the shipment was a set of neoprene coasters featuring iconic imagery of the Outer Banks. Sometimes there’s nothing better to help cure the “missing the OBX blues” than having a keepsake in your home that has a beautiful representation of the scenery on the beach. The coasters did that and more, and we were exceptionally excited to share with our subscribers. Find your own OBX inspiring items in her shop now! 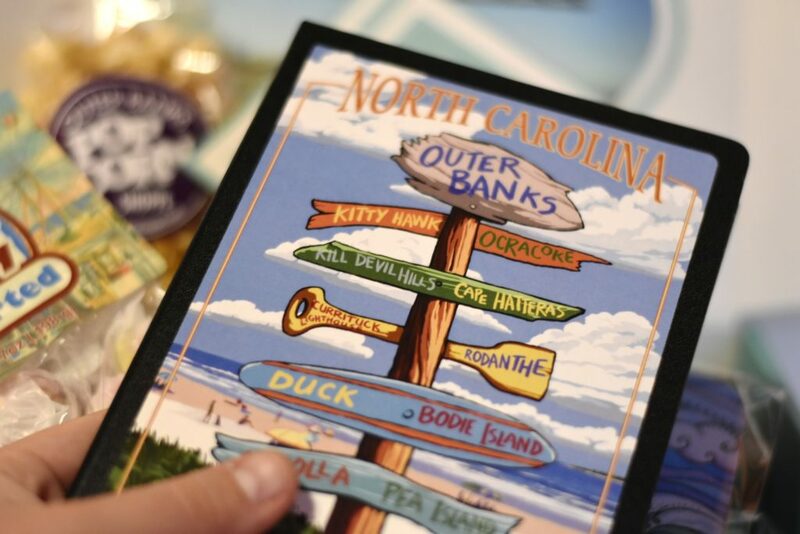 Last but not least, subscribers also received an exclusively produced journal with a beachy OBX signs post print cover. We all know vacation memories are what makes journeys so fun, so we knew this journal would be a perfect gift to keep your precious memories jotted down and saved to recall forever! Like what you see? As of the time of publishing this blog, there are still a few spots remaining for our upcoming summer box! 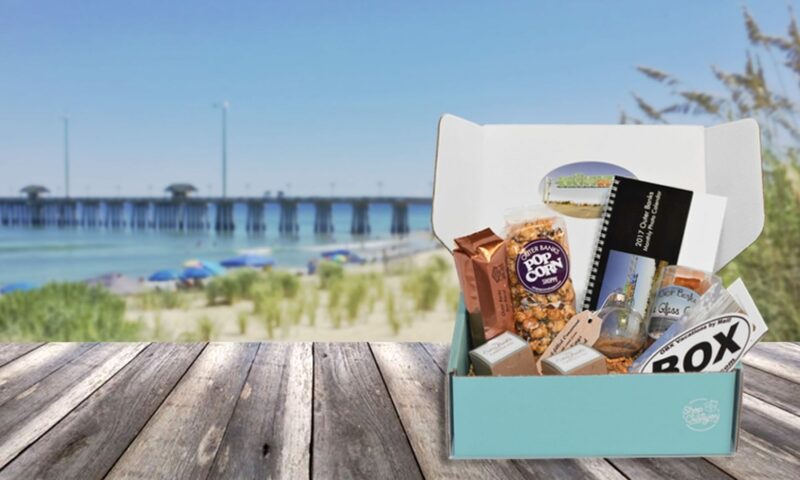 Click the big fancy button below to head over to our ordering section or read more about the Outer Banks Box!